What is it: The Blue Blazer is a stainless steel fountain pen in the “Fortuna” body style from Montegrappa. The pen features a steel nib with an intricate pattern on it that gets fed ink via a cartridge/converter filling system. What makes this pen stand out from the rest is the unique finish, created by applying extreme heat to the stainless steel body. The result is a rainbow-colored swirly pattern that appears to change as the light hits it. Where you can get it: You can pick up a Montegrappa Blue Blazer Fountain Pen from Goldspot Pens right here. The Blue Blazer goes for $450. Orders from Goldspot get free shipping as well as a few freebies that they’re throwing in on orders over $99. Thank you to Goldspot and Kenro Industries for providing this awesome pen to give away! Notes: The Blue Blazer is definitely one interesting pen to look at. The colors, shape, and size of the pen all add up to an impressive looking and feeling fountain pen. Based on the Fortuna body style, the Blue Blazer is a medium-large pen weighing in at a hefty 48g. I don’t think that the pen is too heavy, as it’s nicely balanced and feels good in hand. The cap is quite heavy, and adds a considerable amount of length to the pen when posted. For me, it’s just too much. Some writers may find the pen okay when posted, but I believe most will prefer it uncapped. The clip has a small roller at the bottom and feels really sturdy. The engraving on the cap band and “1912” on the top of the cap add some subtle branding without being too “in your face”. The fine nib on the Blazer lays down a thin line. It’s nice and smooth, especially considering how fine it is. I would say that the ink flow is somewhere between light and medium. This is a nib that I like to use on lesser-quality paper that tends to absorb ink. Since the flow is on the lighter side, it leaves a nice, clean line on standard copy paper. It’s no slouch on premium paper like Rhodia either. The Blue Blazer is an interesting pen. The hand-finished flame burnishing adds a nice touch, and makes each pen unique. At $450, the pen is by no means cheap but it’s one of the more interesting pens out there, especially when compared to all of the other black and silver pens that populate the fountain pen world. Want to get your hands on a Montegrappa Blue Blazer? Well, you just might be able to because this one is being given away. Read on to find out how to enter! The winner was contacted today, thank you to everyone for entering and to Goldspot Pens and Kenro Industries for the awesome prize. Stay tuned for more giveaways in the future!  Subscribe to edjelley.com via email. Please see the below image for how to do that. The sign up box is on the top right of the website’s homepage. Once you’re signed up, please leave ONE comment below. If you are already subscribed via email, just leave a comment letting me know. If you don’t see your comment right away, it may be in moderation, please hang tight! The giveaway is open to residents of the USA only. Please, only one entry per person. Please make sure to use a valid email when commenting, as this is how I will contact the winner. Each entrant will be assigned a number based on the comment section. The winner will be chosen with a random number generator at the end of the contest on Friday, March 16th at 12:00EST. I will never sell your emails or use them for anything else other than post updates when something new gets posted on the blog. Disclaimer: This pen was provided free of charge by Goldspot Pens and Kenro Industries. Please keep that in mind when reading the hands-on. That is a great looking pen. Wow! Thanks for the giveaway & review this looks like a fun pen! Excellent looking pen! Newly signed up. Love this pen and love finding new pen blogs! Thanks for the chance at this beautiful piece of art. I would love the chance to own a fine writing instrument like this. This is a beautiful pen. Would love one to replace my basic fountain pen I currently use. Is the fire-scaled color this intense IRL as well? Lovely. Looks gorgeous! Heavier pens are my favorites. Thanks for the give-away for the Montegrappa pen! I am subscribed! Woah this blog is so cool as a person that loves stationery and pens as I am an amateur calligrapher I can’t wait to check out future posts and hope to win this really rad pen! Oh my word this pen is sooooo beautiful!! Owning one would be a dream! This has rekindled my pen lust. And I thought I was done collecting. And yes, I need this pen in my life too! Montegrappa pens are just beautiful works of art. Thanks for the great review! Great pen, thank you for the giveaway! I’ve been a journalist with fountain pens for 30 years. So glad to find your website with such great info on fountain pens. They are so hard to find locally, as well as the ink. Can’t wait to try your “fountain pen friendly notebooks”. Awesome giveaway! Gorgeous pen. Thanks for the chance. I am now signed up for your email. Thanks for a chance to win such a gorgeous pen. Thanks for the chance at winning this gorgeous pen. I am now following and look forward to your emails. Excited to maybe start -another- expensive hobby! You guys are awesome! What a lovely pen that you are giving away! Just found your blog, happily subscribed, great work from what I’ve read so far. Newly signed up! Thank you for the chance, it’s a beautiful pen! That nib! Thanks for the wonderful giveaway! Thanks for offering this pen! It’s gorgeous. What a beautiful pen! Thanks to everyone involved in making this giveaway happen. That’s one nice looking pen! Great pen – would love to win it! Nice and informative review. Love the pen and would like to add it to my collection. You have some great sponsors, so I am happy to get your email! Don’t remember if I entered yet or not – but I don’t want to miss this! Thanks for the opportunity. I’m subscribed. What a great give away!! Thank you! Love the color/finish of this kind of pen. Stellar. What a beautiful pen and awesome giveaway! This is a beautiful pen and an awesome giveaway. Thank you Ed for all that you do! Hi, I’m sorry if it’s a second comment… i actually wrote the previous one before i subscribed, that’s probably why i can’t find it. But about the giveaway I’m happy for whoever wins! It’s such a gorgeous pen that even looking at its nib is delightful! I’d hate to miss out on a giveaway like this. Subscribed! I heard that Montegrappa was swapping out their Bock nibs in place of the Jowo nib. Do you know if the Blazer ships with the newer Jowo nibs? I’m not sure, you might be better off emailing Kenro Industries!